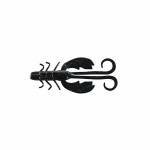 Berkley PowerBait Chigger Craw Soft Bait Series. PowerBaits feature an irresistible scent and flavor that keeps fish holding on 18 times longer than natural baits. High disturbance jumbo pinchers Fish slow on a jig or buzz it on top Sold in bag of 9 ..
Berkley PowerBait Crazy Legs Chigger Craw Soft Baits. High action pinchers create more strikes. 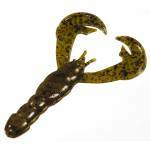 Crazy legs create additional action on fall or retreive that entice fish. Main body can be cut at third leg to fit perfectly on a skirt jig. Loaded with the exclusive Powerbait scent and flavor that bass crave. Ideal soft bait for jigs of all types and sizes. 4" long. Sold in bag of 8. Assorted colors available. .. This beefed-up bait is studded with a unique diamondback texture, giving it an appealing shudder even when fished deadly slow. Featuring Strike King`s Perfect Plastic formula, the Chunk Jr. retains its supple pliability even when left out of the package, for a salty, coffee-scented bite that keeps finicky fish holding on longer. 8 per Pack ..
Strike King KVD SR Chunk Plastic Bait Series. Kevin VanDam and Strike King have designed the perfect plastic trailer that delivers a seductive shuddering action even during slow retrieves. A super soft, salty soft bait loaded with coffee scent, which masks human scents and oils. 3-1/2" long. 7 per package. Assorted colors available. 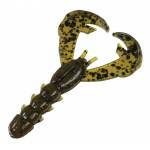 ..
Strike King Rage 3" Baby Craw Softbait Series. 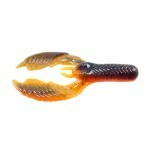 All the great features of the Rage Craw but in a smaller 3" version. Many uses including Texas rig, Carolina rig, jig trailer, more... 9 Pack ..
Strike King Rage DB Craw Softbaits. 4" softbait with a streamline design make this an excellent flip bait for colder waters or when bass aren't looking for fast-paced action. Great choice for Carolina rigs, rigged weightless or as a jig trailer. 7 per package. Assorted colors available. ..
Strike King Rage Tail Craw Softbaits. An ideal 4" softbait that can be fished Texas rigged, Carolina rigged or as a jig trailer. 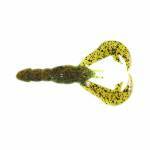 Unique tail design is engineered to splash, make noise and attract fish with action-packed movement. 7 per package. Assorted colors available. .. 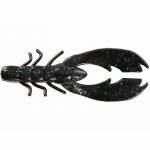 The YUM F2 Craw Chunk features thin oversized claws with raised ridges on the outer edges that exaggerate the flapping and action that signals bass to come to dinner. The Crawdad mimics the colors of real crawdad. 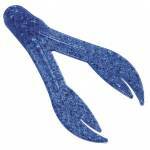 The claws are attached to a realistic solid body that grips jig hooks well when used as a jig trailer or rigged Texas-style when flipping and pitching--a great finesse tactic. 3.75in 8 per pack ..